Te Korito Alpacas, Wanganui. Fibre and knitted products. These knitted and crocheted alpaca products are wonderfully soft as we use home spun wool from only our finest fleeces. Unfortunately, the softness can't be appreciated through a website but it is frequently commented on by our customers! All fibres used are their natural colours. Please bear with me as I get the new scarves photographed and loaded. Our scarves are expertly knitted to unique designs. The fibre is usually 100% huacaya but some blended huacaya/suri is also used which is smoother and more lustrous. All fibre is from our own animals. Click the thumbnails below for detailed pictures. If you are interested in this product or would like further information, please use the 'Contact Us' button below. All of the scarves shown below have been sold but the pictures are here in case you are looking for inspiration. Click the thumbnails with each design for detailed pictures. Should you like a particular design, it can be recreated and even modified to your taste in colours. If interested, please use the 'Contact Us' button. This item is crocheted to be a loop which can be worn as a double circle. Light, very warm and very good to look at! This has an alternative colour combination to the cowl above. This scarf was knitted using four differently coloured wools to make fine lengthwise stripes. The overall effect is an earthy colour. Tasseled ends add a nice touch. Some interesting knitting here to create this 'saw-tooth' effect. Grey and white wool have been used to create this quite striking scarf! The knit is looser making the overall item lighter and softer to the skin. This is made from twin-ply wool, one strand of which is white, the other medium fawn. Hand knitted in length-wise direction with borders down both sides, it has a speckled effect. We have a wide range of colours in our alpaca herd and every year they provide wonderful fleeces for making fibre products. Colour availability will vary with demand for any particular colour. In preparation, the fleeces are skirted and most of the larger vegetable matter removed. Cleaning dirt from the fleece and removal of short fibres is done by air blowing whilst tumbling the fleece in a purpose built cage. The colour availability of fleeces will vary with demand and new colours are available as new animals are shorn. 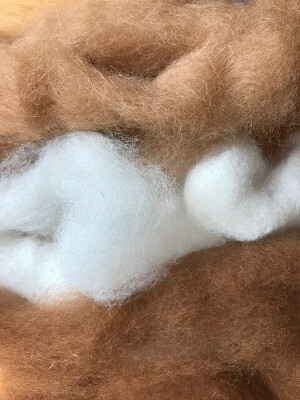 The quality of each fleece is known through wool measurement statistics and so the price per kilo will vary accordingly. Please contact us with your requirements. To achieve the finest product, our fleeces are commercially washed, carded and processed into long, fine slivers. These are particularly convenient for home spinners looking to create their own yarn. Colours available vary so please contact us. Postage must be added and will depend on the weight ordered. 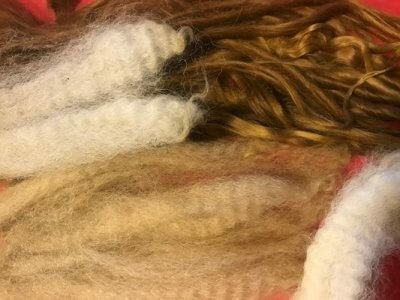 All of our yarn is from our own alpaca fleeces and is mostly from 100% huacaya wool. It is home spun and the colours available will depend on demand. Please contact us for your requirements. If we do not have your preferred colour, it can be spun to order at no additional cost.